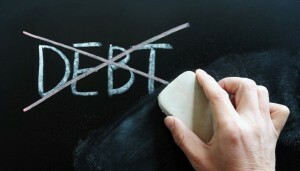 Studies have shown that most payday loan borrowers get stuck in revolving door of debt. 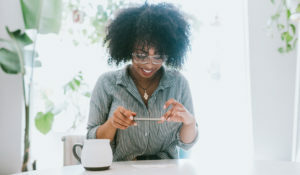 But a recent investigation by the Consumer Financial Protection Bureau (CFPB) found that payday lender, ACE Cash Express, pushed borrowers into a cycle of debt. The CFPB reached a $10 million settlement on July 10 with one of the nation’s largest payday lenders over its illegal debt collection tactics. The case against ACE is the first time that the CFPB has accused a payday lender of intentionally pushing people into a debt cycle. Threatening to sue or criminally prosecute: ACE debt collectors led consumers to believe that they would be sued or subject to criminal prosecution if they did not make payments. Collectors would use legal jargon in calls to consumers, such as telling a consumer he could be subject to “immediate proceedings based on the law” even though ACE did not actually sue consumers or attempt to bring criminal charges against them for non-payment of debts. 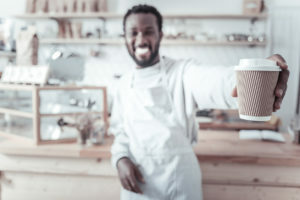 Threatening to charge extra fees and report consumers to credit reporting agencies: As a matter of corporate policy, ACE’s debt collectors, whether in-house or third-party, cannot charge collection fees and cannot report non-payment to credit reporting agencies. The collectors, however, told consumers all of these would occur or were possible. Harassing consumers with collection calls: Some ACE in-house and third-party collectors abused and harassed consumers by making an excessive number of collection calls. In some of these cases, ACE repeatedly called the consumers’ employers and relatives and shared the details of the debt. Pressured into Payday Cycle of Debt: ACE would encourage overdue borrowers to temporarily pay off their loans and then quickly re-borrow from ACE. 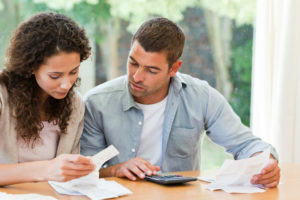 Even after consumers explained to ACE that they could not afford to repay the loan, ACE would continue to pressure them into taking on more debt. Borrowers would pay new fees each time they took out another payday loan from ACE. 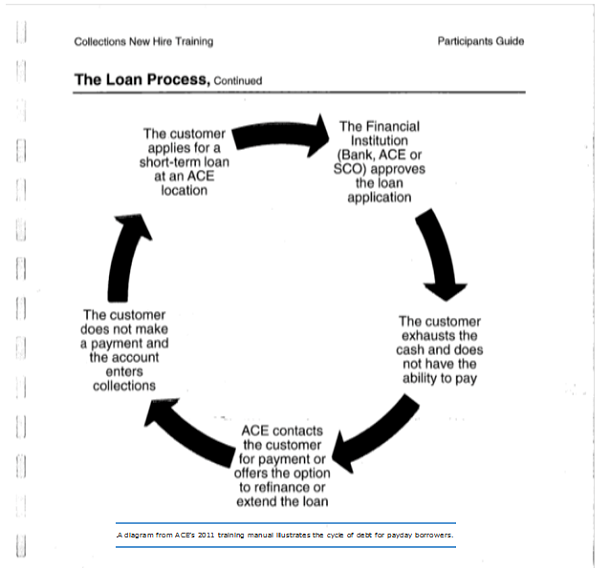 ACE’s 2011 training manual has a graphic illustrating this cycle of debt. 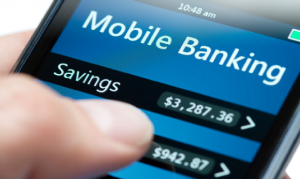 It shows how new employees were taught to contact the customer after he or she “exhausts the cash and does not have the ability to pay.” Employees were instructed to “create a sense of urgency” when calling delinquent borrowers. The Bureau found that ACE’s creation of the false sense of urgency to get delinquent borrowers to take out more payday loans is abusive. 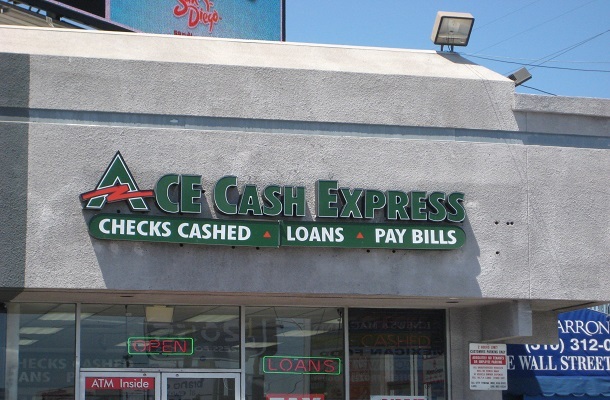 ACE Cash Express is ordered to end illegal debt collection threats and harassment and stop pressuring borrowers into taking out repeated loans. ACE will pay $5 million to the CFPB for penalties and $5 million will be paid to consumers in the form of refunds. ACE will hire a third-party firm to contact eligible customers and issue refunds.